My inner trader uses the trading component of the Trend Model to look for changes in the direction of the main Trend Model signal. A bullish Trend Model signal that gets less bullish is a trading “sell” signal. 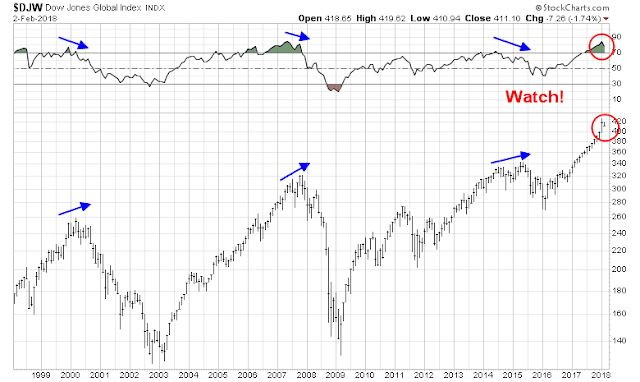 Conversely, a bearish Trend Model signal that gets less bearish is a trading “buy” signal. The history of actual out-of-sample (not backtested) signals of the trading model are shown by the arrows in the chart below. Past trading of the trading model has shown turnover rates of about 200% per month. We had some minor excitement in our household in the last week. 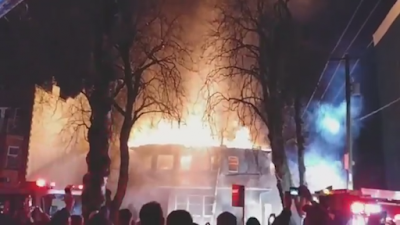 We were at a show when I received a frantic text message that the neighboring building was on fire. Fire fighters were spraying our building as a preventive measure. Mrs. Humble Student of the Market rushed home to rescue the family dog. The house next door was burning to the ground and we were ordered to evacuate. We discovered the next day that our unit suffered water and smoke damage, and it would take several weeks to fix. While the whole episode was disconcerting, it was not a total disaster. I am now living in a hotel and writing this publication on an older rescued laptop, so please forgive me if I am not up to my usual witty and erudite self. The same disconnect happens when you try to forecast how you’ll respond to future risks. How will I respond to the next investing downturn? You will likely be more fearful when your investments are crashing and more greedy when they’re surging than you anticipate. And most of us won’t believe it until it happens. Market volatility has been low, meaning that stock prices have been stable for a long time. Some investors have interpreted this as a sign of current market risk and that there could be a sudden correction in stock markets, meaning many people could be about to lose vast sums of money. Should the stock market crater from here, don’t panic. This is not the start of a major bear market. The chart below shows the history of major stock market declines. 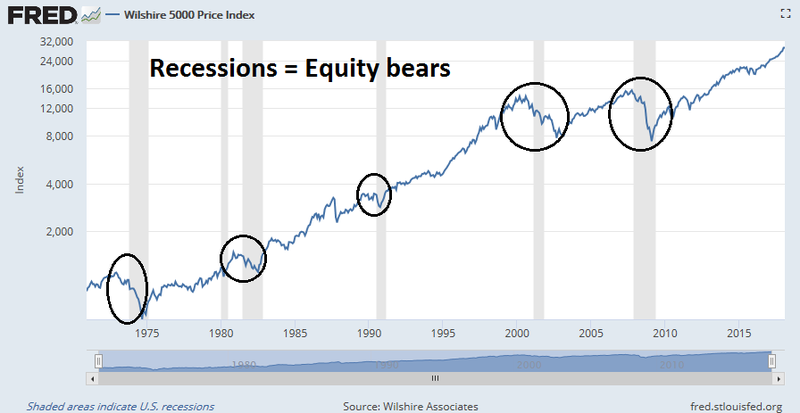 Bear market has either preceded or coincident with past economic recessions. If there is no recession in sight, then investors should not expect a major decline to begin. The corollary lesson to this history lesson is equity investor should be prepared for regular 10-15% corrections. If you can’t stand that kind of risk, then you should probably reduce your equity allocation. As well, I consider the state of the market from a chartist’s viewpoint. As consumer spending accounts for the vast majority of GDP activity, the health of the American household sector is the linchpin of economic health. On the surface, the household sector looks strong. As the chart below shows, retail sales have peaked well before past recessions. Current readings show that retail sales are strong. Some of the household internals, however, are not as healthy. 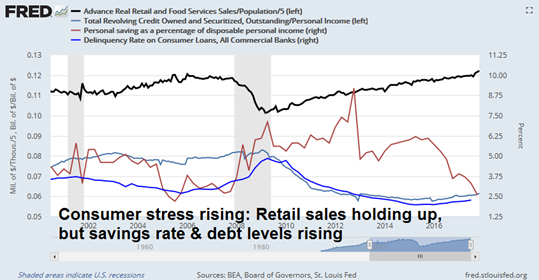 Retail sales are only holding up because consumers are spending beyond their means through a combination of a falling savings rate and rising debt levels. I am also concerned about housing, which is a consumer cyclical and one of the most economically sensitive sectors of the economy. Housing starts appeared to have plateaued. 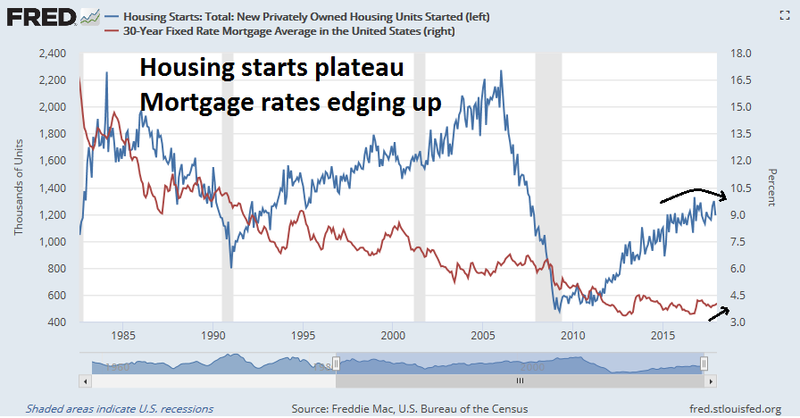 In addition, rising mortgage rates are also proving to be a headwind for the sector. None of these readings are enough to sound the recession alarm, but they are indications of a late cycle expansion. By contrast, the corporate sector is much healthier than households. NIPA corporate profits have tended to peak out before past recessions, and there is no sign of a peak in corporate profits for this cycle. The latest update from FactSet also shows that strong profit expectations. 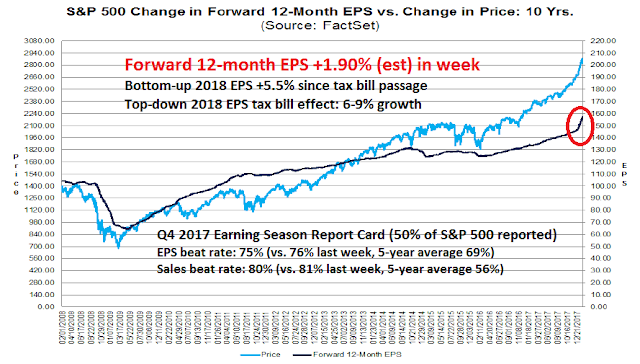 Bottom-up forward 12-month EPS estimates have historically been coincident with stock prices, and they are rising at a robust clip. The latest round of EPS upgrades are driven by two components, a tax cut effect, and a cyclical effect. Bottom-up analysts have been hesitant to upgrade their estimates before the actual passage of the tax bill, because they could not quantify the specific effects on the companies in their coverage universe. The latest figures show that bottom-up analysts have raised their 2018 estimates by 5.5% since the passage of the tax bill. Top-down strategists have not been as shy about estimating the aggregate tax cut effects, and most Street strategists have penciled in a 6-9% tax cut boost to 2018 EPS. This suggests that the bottom-up tax cut upgrades are nearing an end. However, the cyclical effects of earning season remains strong. Both the EPS and sales beat rates are well above historical averages. As the earnings reports were for Q4 2017, they did not include any actual tax cut effects. These reports suggest that the near-term operating outlook still looks strong. 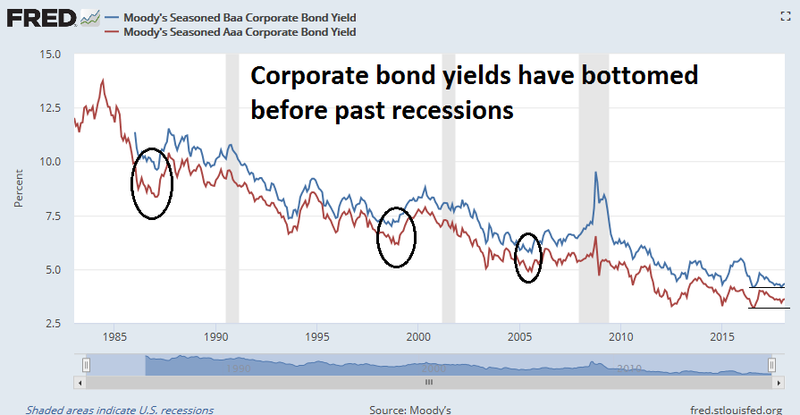 Historically, corporate bond yields have bottomed several years before recessions. Here, the evidence is mixed. The Baa corporate yield made a marginal new low in December 2017, though the Aaa bonds did not make a low that month and the low in August 2016 still stands for the current expansion. 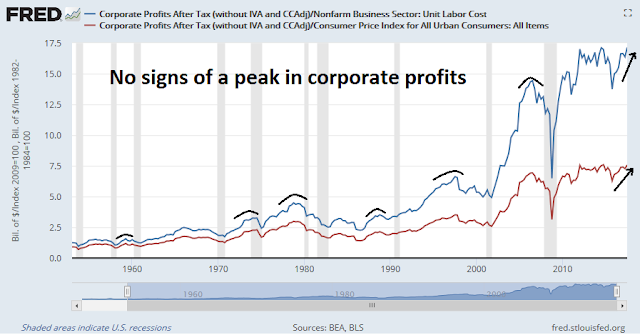 In conclusion, the corporate sector is not flashing any signs of an imminent downturn. In fact, the recently passed corporate tax cuts are likely to provide an additional boost to this sector. Monetary conditions, on the other hand, are a question mark. The markets took fright on Friday in reaction to the January Employment Report. 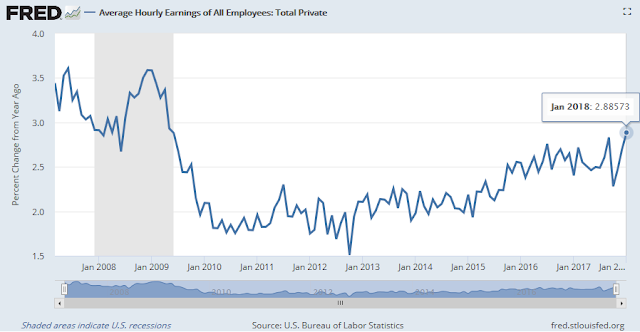 The headline Non-Farm Payroll came in ahead of expectations, and average hourly earnings rose to 2.9%, a cycle high reading that is indicative of rising wage pressures. 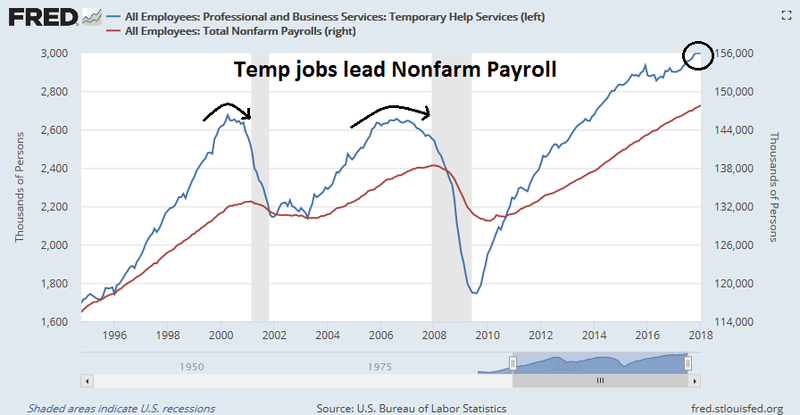 In addition, temporary employment growth may be stalling. 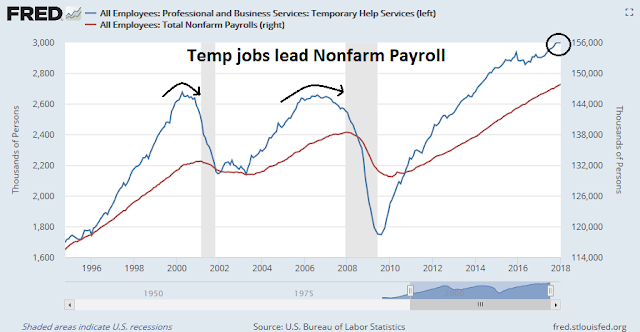 Temp jobs have historically led headline NFP growth, and this raises the risk that the Fed may be committing a policy error by tightening into a weakening economy. 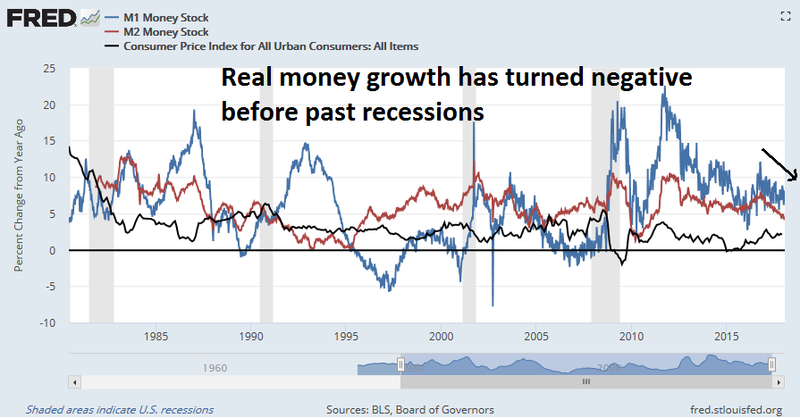 As the Fed signaled at its last FOMC meeting that it is on track for three or more rate hikes this year, money supply growth continues to decelerate. 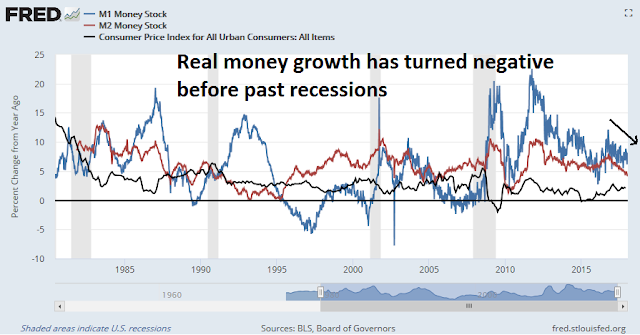 In the past, real money growth, as measured by M1 or M2, has gone negative ahead of recessions. Lastly, no observation of monetary conditions as recession indicators without some comment about the yield curve. 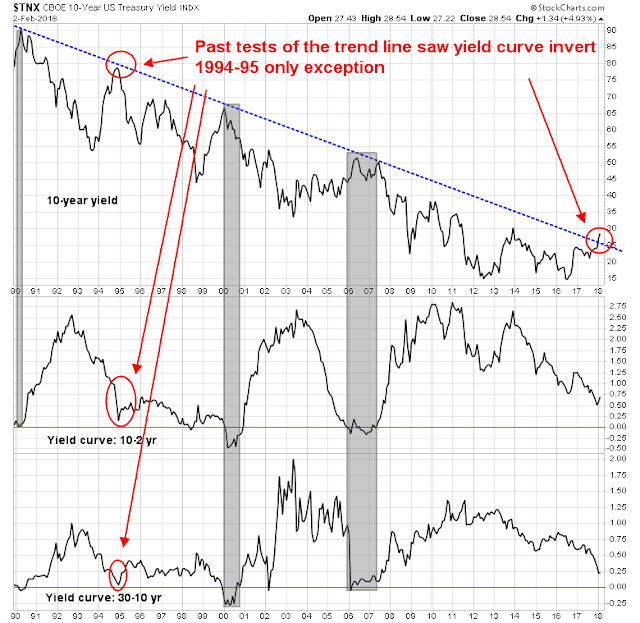 In the past, the 2-10 yield curve has inverted ahead of past recessions. However, the yield curve is giving unusual signals in this cycle. The chart below shows the history of the decline in the 10-year Treasury note yield from 1990. Every test of the downtrend line, with the exception of 1994-95, saw the yield curve invert. Even though the yield curve did not invert during the 1994-95 period, it did flatten quite dramatically. Friday’s market response to the January Employment Report saw the a dramatic rise in bond yields and a steepening yield curve. Another puzzle comes from the behavior of the 10-30 yield curve, which has been steadily flattening to 25bp, a cycle low. I interpret these readings as tightening monetary conditions, but they are not indicative of an imminent recession. To summarize the review of macroeconomic conditions, they indicate an economy that is in the late cycle of an expansion. While conditions are deteriorating, the nowcast of 12-month recession risk is still relatively low. Even though the latest market air pocket may appear as a shock to recent stock investors, the S&P 500 has only retreated 3% off its all-time highs, and corrections are to be expected as part of equity investing. 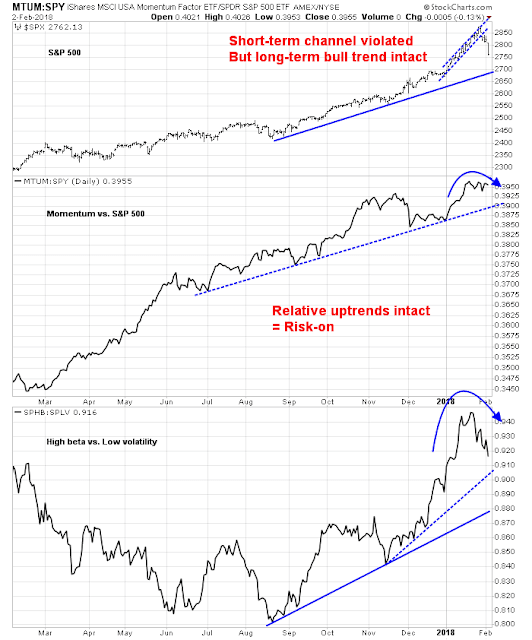 From a technical viewpoint, the intermediate term outlook is still bullish. As the chart below shows, even though the S&P 500 breached its narrow rising channel last week, its uptrend remains intact. Moreover, equity risk appetite, as measured by the price momentum factor and high beta vs. low volatility factor spread, remain in relative uptrends. Initial trend line support is evident at about the 2700 level, which represents a peak-to-trough correction of roughly 6%. For a longer term and global perspective, past equity market tops have been characterized by double tops consisting of an initial top, market retreat, and a second rally marked by negative 14-month RSI divergences. 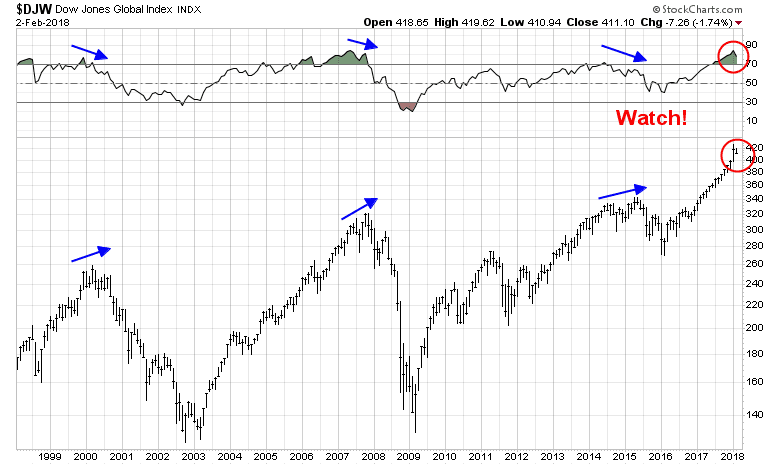 As the chart of the DJ Global Index shows, the latest correction may be a sign that the market is making the first top. Even then, investors should not panic until this technical formation becomes more developed. In short, the market is undergoing a garden variety correction. Equity weakness represents an opportunity to buy the dip. However, it is likely too early to be buying immediately. Late Friday, there was some chatter by the talking heads that the market had become extremely oversold. 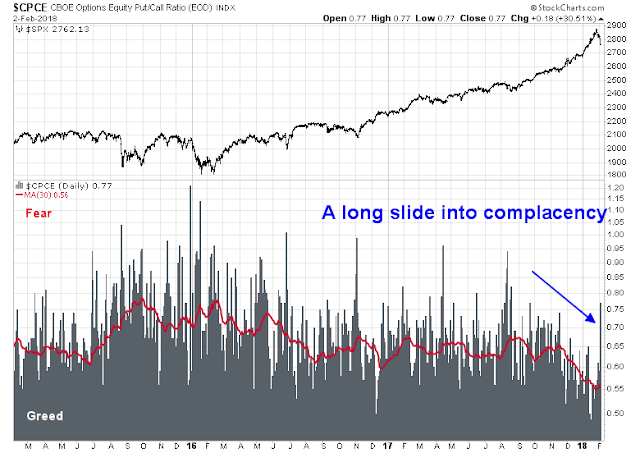 While short-term breadth had become oversold and a bounce is likely in the coming week, there are few signs of widespread fear and capitulation that are the hallmarks of a durable bottom. 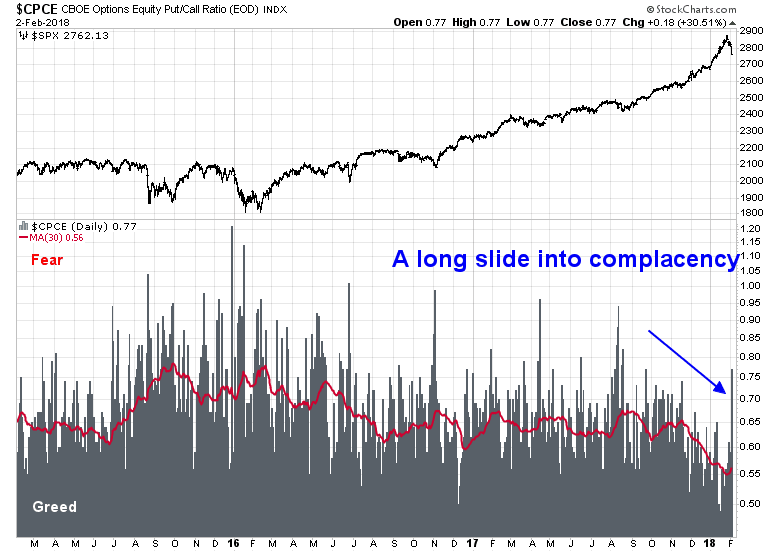 As the chart of the CBOE equity-only put/call ratio shows, the market had been sliding into complacency for several months. It’s hard to believe that a single one-day 2% decline after a steady climb marks the end of the correction. SentimenTrader also observed that small (retail) option traders were buying heavily into the latest decline. That does not sound like fear and capitulation to me. The S&P 500 is oversold on RSI-5, which is a short-term indicator, but not oversold on RSI-14, which is more useful for traders with an intermediate term time horizon. 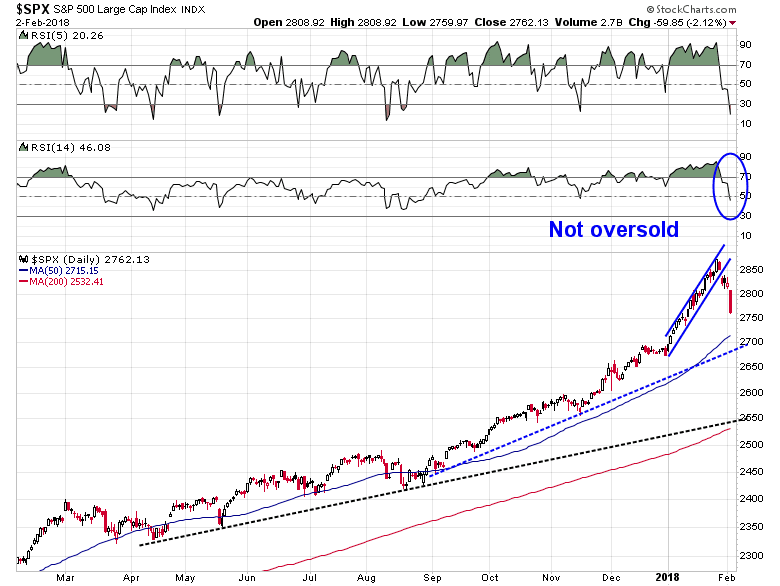 Moreover, the market has not tested initial support at the 2680-2720 region, defined as the 50 day moving average and a trend line representing a peak-to-trough correction of about 6%. Further support can be found at the 200 dma and a second trend line at about 2550, which represents a 10% correction. As well, the Fear and Greed Index has fallen, but readings are nowhere near the sub-20 levels seen in past bottoms. In the past, exacta signals, where two of the three conditions are triggered within a few days of each other, and trifecta signals, where all three conditions are triggered, have been uncanny bottom indicators. Readers who would like to follow this model in real-time can use this link. 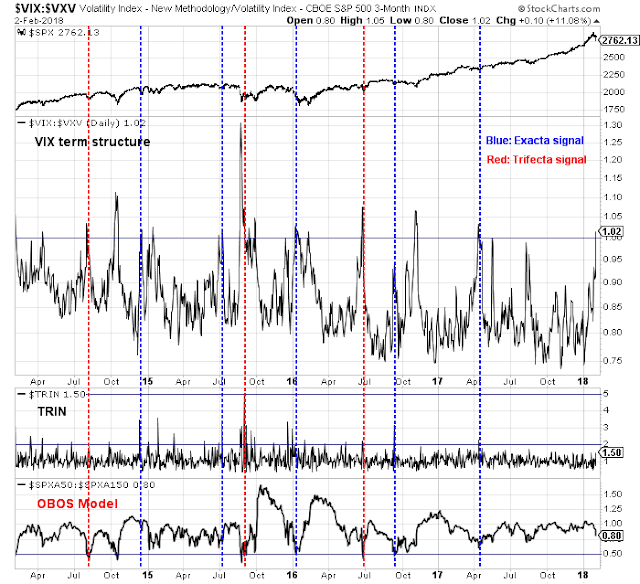 Current conditions suggest that the market is sufficiently short-term oversold that it could bounce next week, but prices are likely to retreat further and retreat further until sentiment gets washed out. We are not there yet. My inner investor remains constructive on equities. My inner trader remains short, but he is prepared to add to his short positions should the market stage a rally next week. Sorry about the damage to your home. Despite the distraction, this is an excellent commentary. Thanks for the excellent ‘business as usual’ commentary, and hope you are back in your home soon. At some point could you review global markets again, and how and whether they might diverge from the US? Hope you and your family get home soon. Thanks for the great work and tremendous effort in this difficult situation. Cam – Sorry to hear about this disruption in your life. That fire doesn’t look kindly. Hope you get back to your normal life soon. Sorry about the terrible news about detour from your normal life. Sending you and your family well wishes for hopefully a quick return to your residence. Living in hotels can be very stressful. Thanks for your work, and prayers for a fast return to normal for you. Let me say something about forecasting our future selves in a panicky market. We want our future selves to be rationally waiting with some cash to take advantage of the folly of others dumping good stocks at panicky bargain prices. To be rationally waiting one must have the right ration of cash to stocks according to one’s personality. It may mean 20% cash to one investor that can be calm if 80% of their portfolio in stocks falls 15%. Another, more nervous investor may need only 50% in stocks as they wait for bargains. The key is having a mindset that is calmly waiting for the opportunity being presented by the downswing as opposed to the worry about the damage to the value of the stocks you still hold. If you err on the side of having too much in stocks during the decline, you will be prone to selling down to your comfort level at a bad time as the decline continues or waiting too long to buy at the intermediate term point when you should. As a further thought, I’ve found in myself that I’ve underestimate my comfort factor before a decline. So now I add more to the ‘cash on the sidelines’ than I first estimate. My studies on behavioral economics has me doubting my own biases. Great that the family dog was rescued. Here’s to a speedy and easy return to your four walls! That crash was caused by the introduction of new investment vehicles that overwhelmed unsuspecting systems leading to panic. We may be in the same environment now unfortunately with the incredible growth of money in ETFs potentially leading to a wholesale selling avalanche of them at some point. I fear the persistent upswing in markets may have been caused by public buying of passive ETFs. These folks may get rattled when things turn down. Looking at Cam’s charts, the last month or so shows a parabolic upswing, unlike the previous gradual uptrend. This may be a rational market reaction to the promise of higher after-tax profits with the passing of the tax bill or it may be the final speculative surge of a bubble-type buildup over the last year. Corrections after a parabolic upswing off a bubble peak are usually nasty. Bubble crashes are happening around us. Bitcoin has fallen in half. Marijuana and block-chain stocks are down 40% in the last couple of weeks. Some social media leaders are falling. Sorry to hear about your house. I hope your and your families’ lives will get back to normal soon. Thanks for sending this excellent newsletter in the middle of your problems. It speaks of your commitment to your work. Again, thanks. Best wishes and best of luck to you and your family in getting your home and life back to normal! First of all, thanks for sending out the newsletter despite your situation and all the best wishes to you and your family! 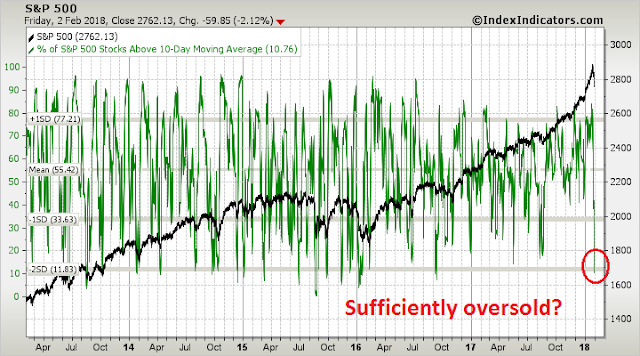 I have a bit of a problem with fear and greed index as it interpretes the lack of bond-buying as bullish sentiment, that is 1/7 of the final score. Research from rennaissance macro says that TLT yield would have to be well over 3% to cause any negativity for stocks, the 2-year yields have been relatively stable since Friday. That doesn’t look like fear of a rate hike staccato to me. I also found it noteworthy that the high P/E stocks like AMZN, NFLX, TSLA or FB held up relatively well. Maybe this is the result of tech investors selling AAPL and buying those stocks instead. But it kind of contradicts the thesis that the stock market has started to price in lower p/e ratios in light of higher future bond yields. As for your comment about FANG stocks holding up relatively well, MTUM was rolling over against S&P 500 before the correction, and high beta is underperforming low vol stocks. These are all indicative of a continuing risk-off environment. Sorry to hear about your troubles and thanks for the great article. Glad to know the dog and your house is still fine with some repairs. Cam – sorry about the damage to your home. I hope things get back to normal soon. Thank you for sending out the newsletter in your current situation. I am really sorry for you and your family. It’s soothing that nobody’s hurt. Good luck with the home renovation and restoration to your normal life. So sorry to see the house fire. It looks downright scary, much like the market. Good to see that you are safe. You short call nailed it. Good job. Can you comment on the market effect of the FED unwind n a post soon? I’m concerned that the FED is increasing the amount of selling by tens of billions each quarter. I think they are at 10 or 20 billion a month now. As I understand it, the Fed unwind involves allowing paper to roll off the balance sheet instead of reinvesting the coupons and maturing paper. There is no actual selling involved.